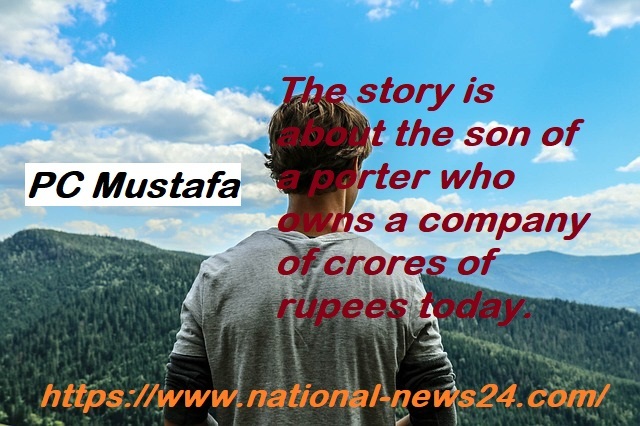 PC Mustafa- The story is about the son of a porter who owns a company of crores of rupees today. There are so many stories revolving around us which is different in itself and he always hides a big struggle with himself. One such story is PC Mustafa - struggling for PC Mustafa, making a hundred crore company. One such idea of ​​business which might not have happened to someone else's mind. By reducing the hard work of making idli dosa, Mustafa brought the readymade Italian dosa in the market and gave the company the name "ID Fresh Food". Mustafa was born in the small village of Kalyan in Kerala and his father had only read up to the fourth grade and used to carry cargo in the coffee gardens. Mustafa's mind was not even studying, so to avoid this, he used to carry goods with the father. After Chhathvi, they did not want to read, but when it felt like living like a father, they changed their way and again started studying ahead of the sixth grade and also passed. When Mustafa was in school, she used to understand Maths only and her teacher used to tell her that you want to work as a father or want to live a good life. From the same thing, Mustafa's imagination of living a good life in mind and he completed his studies and engineering and then started working in a company. Mustafa did a great job in the company and due to this, the company sent him to the UK and after that he returned to Dubai but he returned from Dubai. They came from there and started doing MBA and started looking at some different way. When Mustafa was studying MBA, she would occasionally go to her brother's shop. There was work to sell slurry to make Idli and Dosa. Many women came there and bought the solution. Mustafa himself knew that there was a lot of problem in making Idli with this solution, and that is why she came to know that her business gave birth to a new revolution in the world of packed foods. Mustafa turned his Idea into a business in 2005 and started making a non-chemical batter (slogan of idli). Together with the help of his brother who used to sell this solution earlier. By buying rice, he started making it a batter and started bursting in place. He started making batteries of non-chemicals, which made it quite a lot and everybody used to use them now. In the houses of people, idli started to grow easily, and as easily, Mustafa's catch started growing in the market. However, the people say that Mustafa had made the company in 2005, but it is not so. For three years, he went to the place to work and sell his product without a name. After that, in 2008, he rented a place and gave his company a name "ID Special Food Pvt Ltd", which is also known by the name of "ID Fresh". In the beginning, like every businessman, Mustafa also used to carry a small target. His goal was that he sold almost a hundred packets of the day and he used to do the same. After this he invested six lakh rupees in his business within six months and after installing grinder 15 and grinder, Mustafa's production increased and within two years he started selling two thousand packets of bread in the year 2010. Mustafa's business started to grow very fast and people loved their product very much. Coming down the year 2014, Mustafa gave the company a new height and now it was visible to the rest of the investors. In view of the growth of his business this year, "Helian Ventures Partner" invested 35 crores in his company and his work continued to grow. About six hundred people started working in his company. Mustafa's dream was also that he wanted to give the work to the people and it almost started to complete. If you talk about today's time, about 1100 people work in Mustafa's company. Mustafa started his work with selling ten packets daily, but today this sale has reached fifty thousand packets daily. Apart from this, he is selling about forty lakh chapati, two lakh parathas and two thousand packet chutneys. Work from Idli has reached different products today. Mustafa's business has reached almost eight cities today. As every successful businessman has to think that if he brings the work further, Mustafa is also the same goal. In the year 2016, he gave an interview in which he had said that in the next five years, he wants to reach his company's turnover of almost Thousand crore. Apart from this, they want their products to be sold in eight more cities. Mustafa has now made this business online so that his company and product reach the country. Apart from the country, Mustafa has also started work in Dubai. IIM is called an institute where large businessmen go and there is a big deal in themselves. He was honored at the 45th installation ceremony of IIM Bangalore. The son of a porter today has become a business Ideal for the country. Mustafa says that if you have any idea, then you should give it the form of business as soon as possible and bring it forward and do not ever avoid it tomorrow, because it never comes tomorrow.